The ALS Association Golden West Chapter proudly announces FosterDouglas Real Estate as the 2018 Walk Corporate Champion and Peter Kristensen as the 2018 Walk ALS Hero for the 15th Annual Ventura/Santa Barbara County Walk to Defeat ALS®. The 2 mile walk will be held on Sunday, October 7, at Plaza Park, in Ventura County and is free and open to the public. All funds raised support the mission priorities of the Golden West Chapter in care services, public policy, and research. 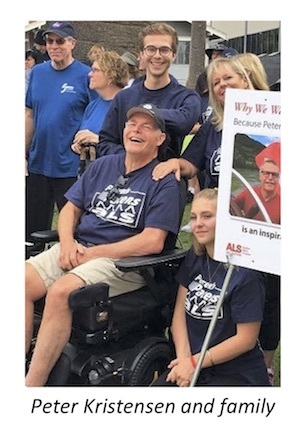 Peter Kristensen will receive the 2018 Walk ALS Hero award which is presented to an individual who is making courageous and inspirational efforts in the areas of advocacy, fundraising, and public awareness while living with ALS. Prior to his diagnosis of ALS in October 2016, Peter had been active in commercial real estate for 30 years, the last 16 with Warner Bros. Corporate Real Estate. Peter enjoyed being active often working out and running 3 to 5 miles daily. He loved family trips for skiing, boating, camping and traveling the world. With the amazing support of his wife, Nicole, and two kids, Tyler and Amanda, Peter’s been able to be as active as possible despite physically declining rapidly. FosterDouglas Real Estate will receive the 2018 Ventura/Santa Barbara County Walk’s Corporate Champion Award for their ongoing philanthropy of time and financial resources in support of the ALS community in Ventura and Santa Barbara Counties, and to the global search for effective treatments and cures. FosterDouglas’ support will be generated via the "Your Referrals Help Families" campaign, wherein the company donates a portion of every sale to The Golden West Chapter. Denise Cifu, Senior Vice President, FosterDouglas Real Estate has also been named Honorary Chair of the Ventura-Santa Barbara County Walk to Defeat ALS. To find out more about more about FosterDouglas’ commitment to community, please visit their website. To join FosterDouglas at the Walk or make a donation in their honor, please visit the FosterDouglas WalkTeam Page. For questions about the Ventura/Santa Barbara County Walk to Defeat ALS, or to register, please visit our website (Ventura-SBWalktoDefeatALS.org) or contact Jessica Partida, Regional Director of Community Outreach at jpartida@alsagoldenwest.org or 818-865-8067 ex. 233.